I didn’t love cars as a teenager, and now regard them only as annoying and expensive necessities for simply getting from A to B. Up to this very month, I knew absolutely nothing about auto racing. If I thought about it at all, I tended to think of Mission Raceway only when the roar of car engines intruded on the silence of a Saturday morning. Obviously I had a lot to learn. And Mission Raceway Vice President Ken Lowe was just the guy to teach me. “Of course you’re misinformed”, he told me right out of the gate. “But you’re right about one thing. People do tend to think of us as the red-headed stepchild”. He looks out over the impressive expanse of his racetrack, lying peaceful and quiet this morning in the autumn sunshine. “People do complain”, he acknowledges. “We do generate noise, but in truth it’s a big factor for only five weekends a year. And these same people don’t realize how many dollars we bring into the economy of Mission”. Now he’s got my full attention, and I want to know numbers. “That’s very difficult to determine”, he says, “but I can tell you this. Because of track repair problems last season we were shut down for several months. A lot of local businesses approached us during that time, very concerned that we weren’t running. All of them reported that their revenue was down substantially”. Race Director Wally Duperon joins the conversation. “We attract upwards of 50,000 racers, support teams and spectators every season”, he says. “On average, one car comes here with four people attached. Sure, many of them camp on the property, but they still need groceries, fuel and entertainment. They go out to dinner, and they buy parts. That’s a lot of dollars flowing into Mission”. Smart, savvy and articulate, Ken and Wally both have deep roots in Mission, and both are passionate advocates of the sport of auto racing. 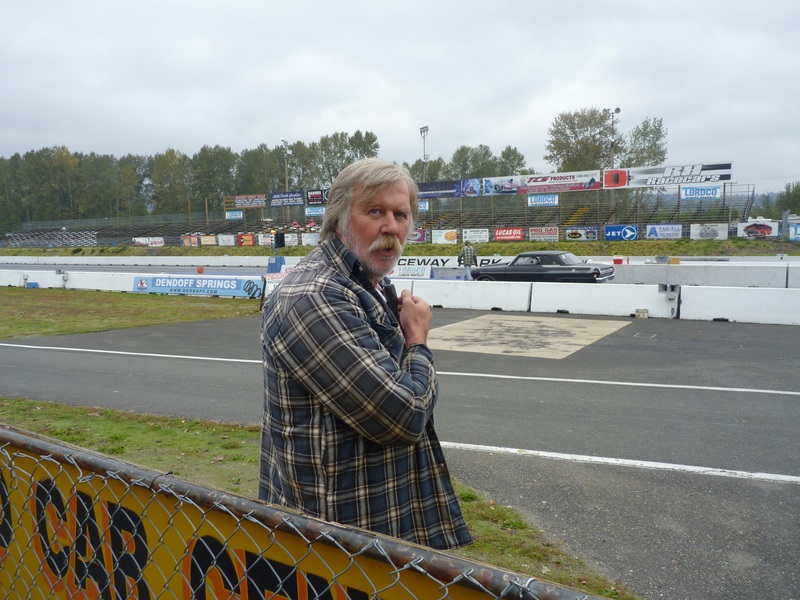 Owned and operated by the British Columbia Custom Car Association, Mission Raceway Park is a NHRA sanctioned track consisting of a ¼ mile drag strip, a 2 km nine turn road course and a 3 km motocross track. Started in 1965, it was first located on the site of the present Junction Mall, and when the Fibreglass Canada plant was first contemplated, was forced to close. After years of negotiations, the new MRP was opened at its present location on March 14th, 1992. Economic impact aside, the entertainment and social value of the Mission Raceway is substantial. The track hosts a number of community events, including The Mission Arts Council’s “Tribute to the Walking Dead” each October near Halloween. And their Friday night “Street Legal” races go a long way to engage kids and reduce the dangers of street racing. But it is the excitement of the racing itself that is the big draw, and 50,000 people form a significant sub-culture. All to watch two vehicles roar down a track for a quarter mile? What could possibly be the appeal? “Racers are an extremely eclectic group”, Ken tells me. “Lawyers, doctors, truck drivers. We have racers from eight years of age right up to seasoned professionals, and one guy in his eighties. And the vehicles range from off the street jalopies, to pickup trucks, and right up to sophisticated NHRA professional race cars. Everybody and every car is welcome here, as long as they observe the rules and stay safe”. Safety is Ken and Wally’s main concern, and is greatly appreciated by all participants. But the track’s main drawing card is its location – almost at sea level and close to the Fraser River. Why? “Thick air”, says Ken. Every speed record there is to break has been broken here”. A fact not unnoticed internationally. 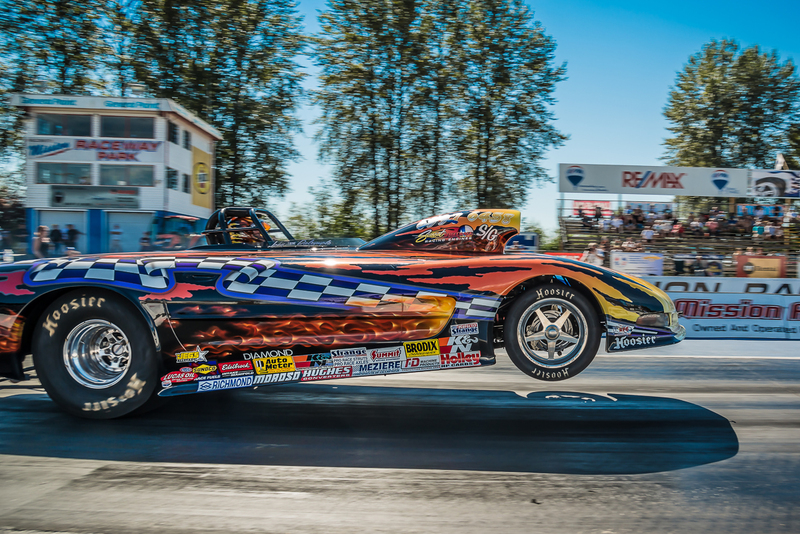 Mission Raceway Park has won the NHRA Division 6 Track Of The Year Award an impressive nine times, from 1994 to 1998, and again from 2005 to 2007. Mission is on the map in the drag racing world. Ken and Wally explain that thick moist air means more horsepower, and more horsepower means faster speeds. What makes drag racing so compelling and interesting is the heady mixture of pure physics and the human factor. They talk about the importance of suspension, tire age and inflation, specially designed seven stage clutches (“so the spin goes into the clutch and not the wheels”). They describe different ways to increase horsepower, and how critical it is to put the day’s atmospheric pressure into the equation. And keeping the front wheels on the track. “You can have balls of steel”, says Wally. “But you never want your front end in the air. One small move of your steering wheel and you’re in real trouble when you come down”. Frankly, I am fascinated. And even more so when I learn about handicap contests that are not all about raw speed. Instead, they demand that the driver knows his or her vehicle and its response to the day’s conditions well enough that they can forecast their race time in advance. “If a driver posts his time at 10 seconds, and actually finishes in 9.8, he is disqualified”, says Ken. The winner is the guy who is closest to but not under his posted time. That’s where the human factor really comes into play”. Wow! This is worth another look. So the next morning finds me back at the track as an excited first time observer of the real thing. Two at a time, I watch as every conceivable vehicle ever on wheels lines up for a turn – sedans, trucks, sleek racing cars – first churning out blue smoke as the tires spin (to get rid of any glazing, I’m told), then inching forward to the starting line. I watch as the lights on a central pole called the tree count down – one yellow, two yellow, three yellow, then red, orange and finally green. It’s all about anticipating the tree, Ken had told me, and races are won or lost right there. Then a huge roar as the cars hurtle down the track, and ten seconds later, it’s all over, until the next pair comes up for their turn. Finally, I talk to two employees of SMS Equipment, here on their day off with their race car. “The adrenaline rush is huge”, says Operations Manager Rod Allen, himself a long time participant in the sport. “All the while you’re waiting your turn, getting closer and closer to the starting line, a million details are going through your head. There’s a lot of science that needs your full attention”. Happy racers, happy fans, happy supporting businesses. Mission should be proud of this success story. Looking out onto the track, I catch the eye of Ken Lowe, and recall his final comment from the day before. “This is what keeps me alive”, he said. OK, Ken, I finally understand. Thanks for reading this, Brian. It was fun to write, because, as I confessed at the beginning, cars are not my thing. But the Raceway certainly grabbed my attention. It is an exciting and very well run operation.